Enjoy top performance, total reliability, and impressive colour quality every time you print with the SAMSUNG CLP-510D7K/XIP black toner cartridge. Imagine a printer that operates quietly and allows you to concentrate on other important tasks while it prints. The NO-NOIS engine design means the toner is stored in a fixed cartridge mechanism, eliminating noise and vibration. Far quieter than its competitors, this machine registers at 48 decibels for colour printing. SAMSUNG printer cartridges are easy to replace. Simply follow three easy steps: open the front cabinet, change the cartridge, and close the cabinet. Simple as that! SAMSUNG toner cartridges are designed for high-quality, vibrant and crisp output for all kinds of applications. Whether you want a glossy photo, a magnificent poster or just want to print official or personal documents, SAMSUNG toner cartridges offers cost-effective and reliable results. They are easy to install and is perfect for everyday use in a wide range of printers. 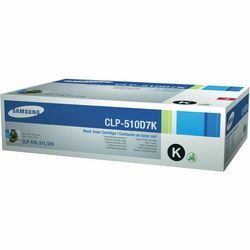 Enjoy top performance, total reliability, and impressive colour quality every time you print with the SAMSUNG CLP-510D7K/XIP black toner cartridge. Imagine a printer that operates quietly and allows you to concentrate on other important tasks while it prints. The NO-NOIS engine design means the toner is stored in a fixed cartridge mechanism, eliminating noise and vibration. Far quieter than its competitors, this machine registers at 48 decibels for colour printing. SAMSUNG printer cartridges are easy to replace. Simply follow three easy steps: open the front cabinet, change the cartridge, and close the cabinet. Simple as that! SAMSUNG toner cartridges are designed for high-quality, vibrant and crisp output for all kinds of applications. Whether you want a glossy photo, a magnificent poster or just want to print official or personal documents, SAMSUNG toner cartridges offers cost-effective and reliable results. They are easy to install and is perfect for everyday use in a wide range of printers.